A few years ago I was visiting Prague with a friend. The Czech Republic was the second to the last leg of our month-long backpacking trip through Europe and, by the time we arrived, we were harried and overwrought. Early mornings and late nights for weeks on end had left us exhausted to tears, but there was a whole world to see so we couldn't justify waking up later than eight in the morning. We saw castles and churches. We walked the city in every direction with a tour guide who would certainly win the gold medal in speed walking. Yet, I remember very little of what we learned and, without the photographs as proof where I'd been, I'm not sure I'd remember even that. There is, however, one thing about Prague I will not ever forget. It happened while my friend and I were walking back to the hostel the next night, after a wasted day of blissfully napping in public parks and eating sausage. Rounding a corner on a small, cobblestone street, I came across a sight I will certainly never see again. We passed a man. Looking ahead, we both stopped dead in our tracks, dumbfounded. It was as if every eligible bachelor within a few years of my age was walking down this particular street at precisely the same time. There were at least one hundred men. A quiet congregation, there was no clear message as to who they were or where they were going. I stood, slack-jawed and wide-eyed, in the center of the street. One hundred men were there, it seemed, just for me. It took quite some time after the last of the men had rounded the corner before my friend and I could regain control over ourselves. We looked at each other in disbelief. I wondered aloud if that had really just happened, wanting to pinch myself as if I were in a dream. I wanted to follow them back around the corner to verify they were real and not a fantastic hallucination. Though we hadn't been searching, we had unwittingly found all of the men. To this day, their presence and purpose remains a mystery. A truly unusual life moment, I can't help but want to dig deeper, to find meaning (though there certainly will never be one). It was Prague's beautiful gift to me, as if it knew that I needed a reason to remember the city outside of my photographs. 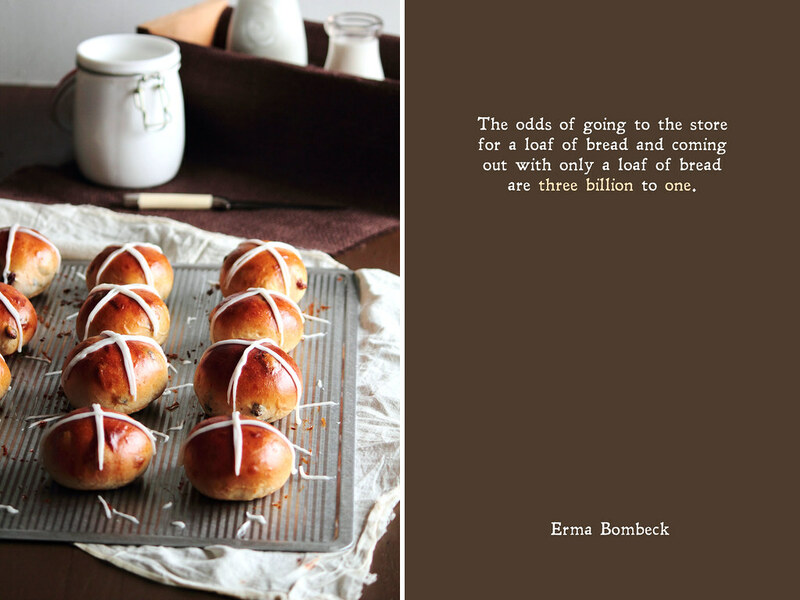 Though these hot cross buns may not be as unforgettable as a parade of men, they surprised me. 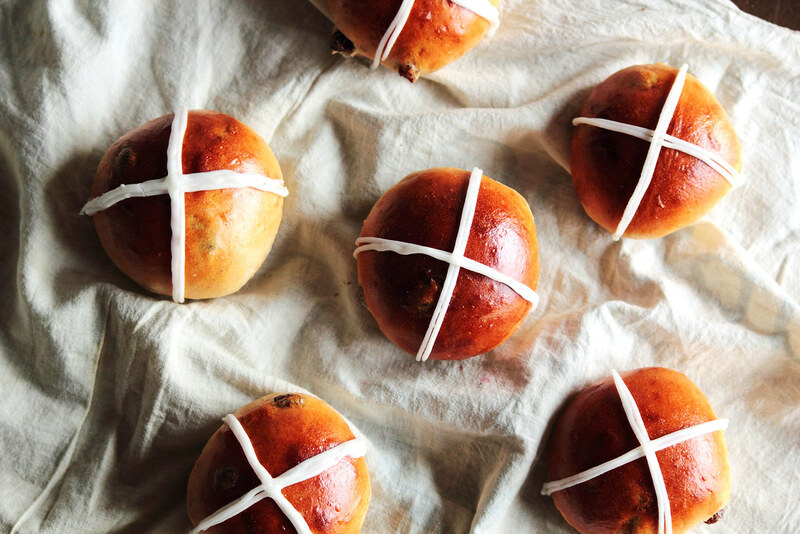 I knew of hot cross buns for as long as I can remember—from nursery rhymes and grocery store shelves—but I never foresaw they would taste this good. 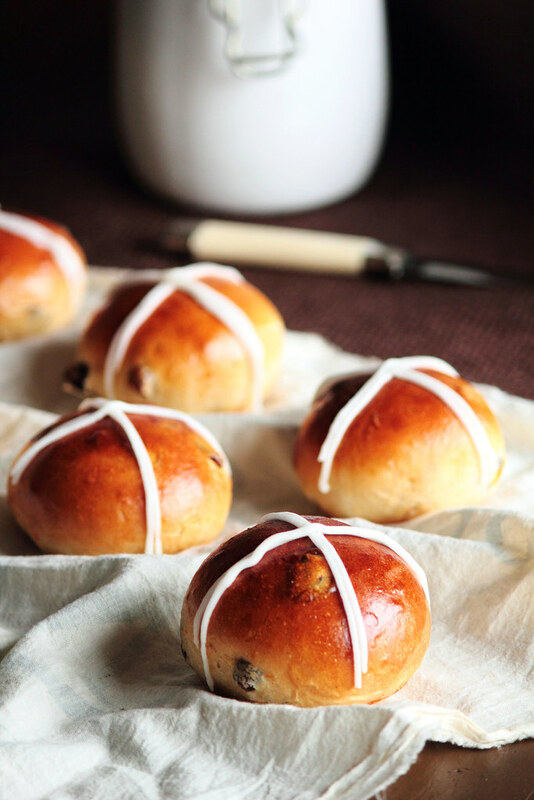 As a baker, I love to get caught off guard by something unexpected and these did just the trick. 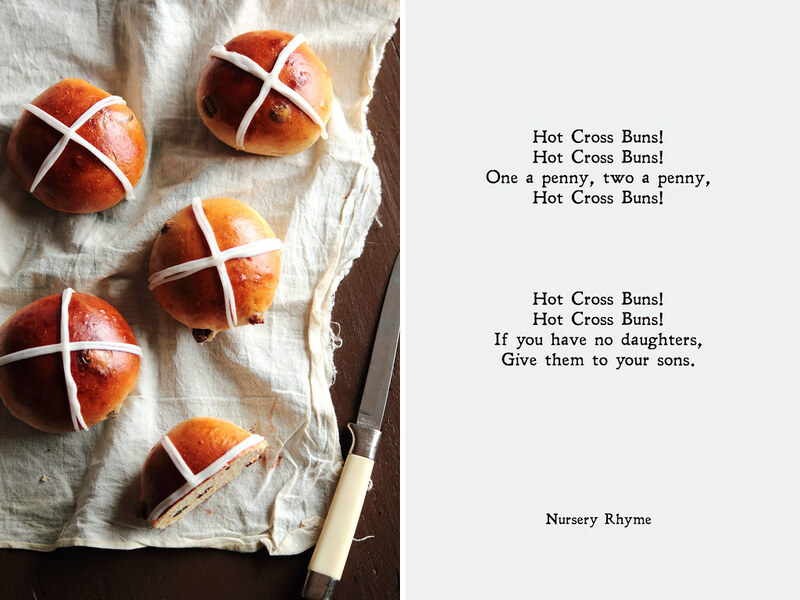 These Hot Cross Buns are soft and sweet. I used the base from my honey rolls, opting for milk instead of water to create a more tender bread. 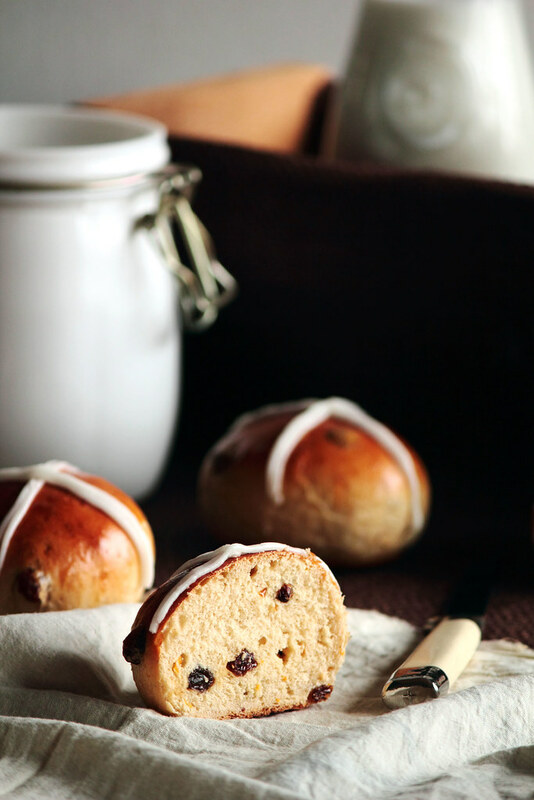 Sweetened with honey, a hint of orange, and a handful of raisins, these buns are surprisingly remarkable. 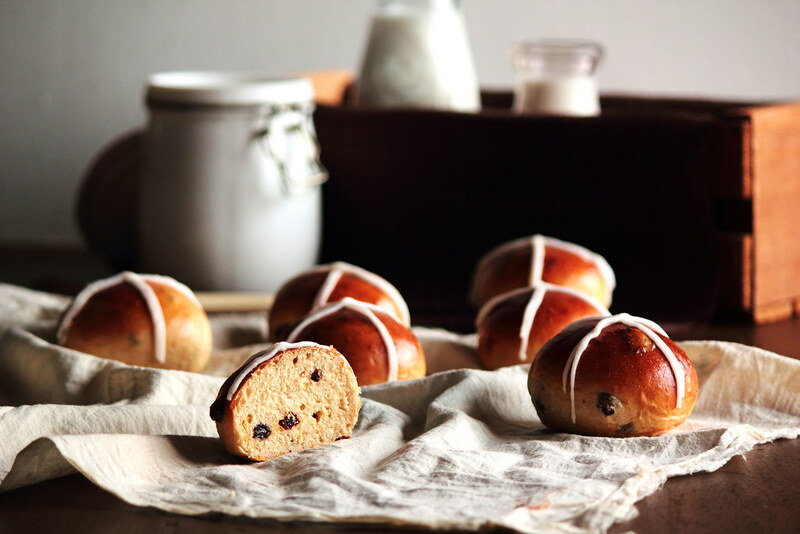 Though sacrilege in some circles, I used a cream cheese icing to make the traditional crosses simply because I think the tartness of the cheese complements the sweetness of the bread better. Make these rolls for those you love—it's far too easy to eat more than your fair share in one sitting.